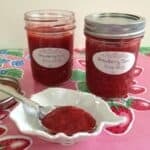 What I like best about this jam recipe is that it doesn’t use commercial pectin to thicken the jam. It uses natural pectin in the form of lemon juice and apple, which are easy to have on hand. This type of pectin doesn’t firm up as densely as boxed pectin. The consistency is looser and has a very homemade quality. The jam can be used on toast and or as a topping for yogurt or cheesecake.